This heavy duty portable fireplace is ideal for deck parties, outside picnics, camping, roasting marshmallows and open-pit barbecueing. Its safety ring/foot rest handle allows for movement when hot and its rain/flame cover can smother fire. Its welded grill construction will guarantee decades of use! 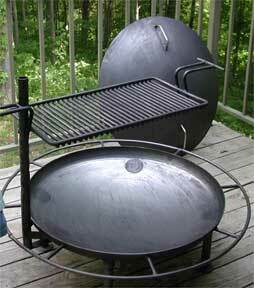 FIREPAN's unique cantilever design holds grill at adjusted position and allows for swing away access for cooking. The grill upright post is removable. FIREPAN has 4 screw-in legs for stability on hard surfaces or at the beach. No tools are required, no screws or fasteners to rust! FIREPAN burns wood or charcoal. *Shipping Note: Flat rate shipping applies only to the U.S.A. continental 48 states. For Shipping out of the continental 48 states, please contact us for shipping rates.